Wolfsburg - As impressive as VfL Wolfsburg's collective performance was in the 4-1 humbling of Bundesliga leaders FC Bayern München on Friday, one man nevertheless stood out from the crowd: playmaker . Question: Kevin De Bruyne, Germany’s footballing community has been asking itself how to beat Bayern and now Wolfsburg have managed it, winning 4-1 at that. How did you do it? Kevin De Bruyne: I know how things work and now everyone will be talking about us beating Bayern, and that’s great. We can enjoy the win for the next two days but we only collected three points after all. Of course it was nice to put on such a great performance against Bayern of all teams. The key was being fearless and putting ourselves on the front foot. We did that really well. Question: What tactics are needed to beat Bayern? De Bruyne: Bayern usually take a lot of risks and that normally works pretty well against most of the teams in the Bundesliga. For our fourth goal especially they left us a lot of room; their backline was even in our half so we couldn’t be offside. You have to take risks against Bayern and that worked out well for us today. I’m proud of the team because every single player did a great job, especially in defence. Question: Your second goal to put Wolfsburg 4-1 up showcased both your speed and outstanding technical ability. How did you perceive the situation at the time? De Bruyne: It was a one-on-one situation and Dante was expecting me to shoot with my right foot but I teed it up on my left. As soon as I struck the ball I knew I’d hit it well. It was a nice goal. De Bruyne: No, we need to stay calm. We got three points but we’re still eight behind them. Maybe some other teams will try to play like we did and that could put Bayern under pressure. But Bayern are still Bayern and they’ll win a lot of games. We just need to focus on our next games. Question: Surely Bayern must respect Wolfsburg a great deal more now after that game? De Bruyne: Maybe. I think other teams in the league respected us a lot given how well we’re playing at the moment. It’ll be a different game on Wednesday against Eintracht Frankfurt as we’ll be the favourites to win it. We need to have clear heads in order to get the points there. Question: In the first half of the season you were in outstanding form. Did you expect to be so good so soon after the winter break? De Bruyne: I didn’t think I would feel so good today. The last few weeks have been difficult for both me and the club. Of course I’m happy with my performance. It’s good that we’ve got three games in a week right at the start of the second half of the season as that’ll keep us busy. Question: Your displays will have attracted the attention of some of Europe’s top sides. 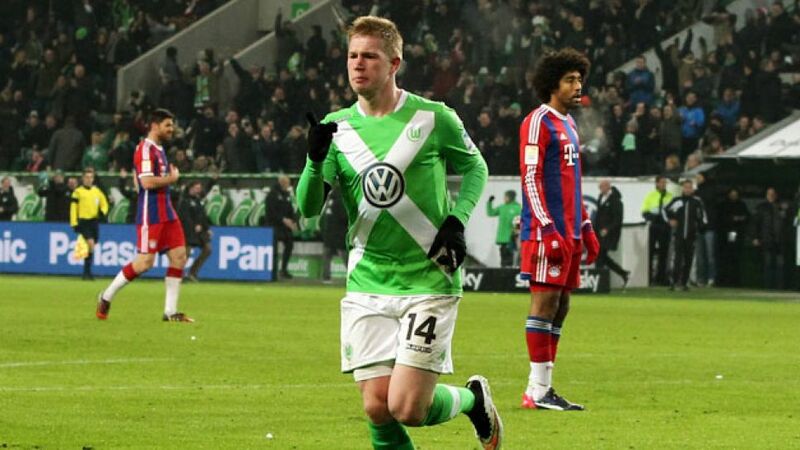 Should Wolfsburg fans be worried that you’ll move on in the summer? De Bruyne: I’m only concerned with the here and now. At the moment I’m playing well, the whole team is playing well and that’s what’s important. Our objective is to reach the Champions League and to win as many games as possible. I hope I can maintain my performance levels. Question: You and Bas Dost formed a wonderful attacking partnership against Bayern. How do you rate his performance? De Bruyne: Everyone will say he played unbelievably well. Bas and I get on well and it helps that we speak the same language. He knows what I do and I know what he’s going to do. He’s had a difficult time in Wolfsburg recently but now the outlook has changed for him after Ivica Olic left the club. I hope he can keep playing well.